The Mercedes G-Class has been around since 1979. Yes, it’s been updated repeatedly over the years, but the basic platform remains the same. That’s all . Until then, however, Mercedes is making sure its current icon goes out in style with the new Mercedes-AMG G63 and G65 Exclusive Edition. 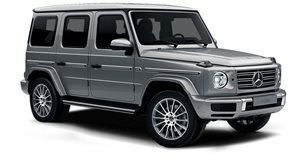 Both are already considered the top-of-the-line G-Class, but the new Exclusive Edition goes a step further. The exterior is an exclusive AMG Monza grey magno finish, which is optional. There’s also a sport dynamic visual appearance, specifically the underride stainless steel guard, AMG racing stripes on the sides, rub strip inserts in a dark aluminum and spare wheel covered in the vehicle’s paint color. The G63 comes with 5-twin-spoke alloy wheels painted in matt black, while the G65 features ceramically polished light-alloys with the same 5-twin-spoke design. Both SUVs can be had with optional 21-inch alloys. Step inside and you’ll be welcomed by the Exclusive package, featuring a two-tone leather-trimmed instrument panel and AMG sport seats, also covered in two-tone upholstery. Buyers can choose from a variety of two-tone color schemes as well. Both SUVs feature diamond pattern seat and door center panel inserts, as well as a choice of AMG carbon fiber or black designo lacquer trim. There’s also a Seat Comfort package with multicontour and climate-controlled seats for both driver and front passenger. What’s under the hood remains unchanged; either a 5.5-liter twin-turbo V8 with 544 hp, or 6.0-liter twin-turbo V12 with 612 hp. Pricing? Not exactly cheap. 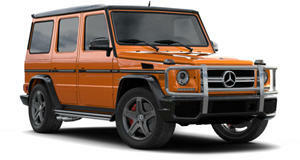 The AMG G63 Exclusive Edition starts at 163,125 Euros while the G65 begins at a hearty 287,658 Euros.